WACO, TX--(Marketwire - February 1, 2011) - Football fans are planning for the biggest game of the year. But if they don't tackle some plumbing precautions before kick-off, Mr. Rooter® Plumbing predicts their Super Bowl parties could turn into Toilet Bowl disasters. Super Bowl Sunday is the second-largest day of food consumption, according to the American Institute of Food Distribution. It's behind only Thanksgiving, which is in the busiest time of year for Mr. Rooter plumbers. "Just like the holidays people pile into homes for Super Bowl parties, where they eat and drink more than usual," said Mary Kennedy Thompson, president of Mr. Rooter Corporation. "This can put a strain on your home's plumbing." With toilets and garbage disposals working overtime, it increases the odds of them overflowing, getting stopped-up and malfunctioning. Mr. Rooter Plumbing recommends homeowners prep their bathrooms before their guests arrive, and keep an eye on their kitchens during the game. 1. Remove small objects and clutter on toilet tanks that could fall in, causing it to clog. 3. Ensure a trash bin is in the bathroom. Don't flush paper towels, napkins or facial tissue, which could lead to a clogged toilet. 4. Don't overload garbage disposal with leftovers, which could lead to a clogged kitchen sink. 5. Throw scraps in the trash or compost pile. 6. Avoid pouring grease down the drain. Once the game is over and the guests have left, homeowners may find their garbage disposal needs a cleaning. Mr. Rooter Plumbing has a simple, inexpensive way to deodorize it -- all you need is ice cubes and citrus peels. Pour a large bowlful of ice cubes and a cup of orange, lemon or lime peels in the disposal. Turn on cold water and then the disposal for 30-45 seconds. Finally, turn off the disposal and continue to rinse with hot water for 15 seconds. 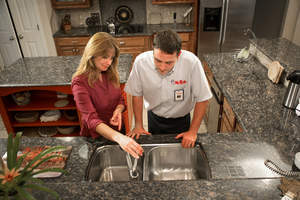 Established in 1970, Mr. Rooter is an all-franchised, full-service plumbing and drain cleaning company with approximately 300 franchises worldwide. Recognized by Entrepreneur magazine among its "Franchise 500" and Franchise Times Top 200, Mr. Rooter franchisees provide services to both residential and commercial customers. Mr. Rooter began franchising in 1974 and is a subsidiary of The Dwyer Group, Inc. For more information or to find the location nearest you, please visit our Web site at www.mrrooter.com. Mr. Rooter provides tips on how to avoid 'bad breath' for your garbage disposal and keep your kitchen smelling fresh. Mr. Rooter has tips to keep your kitchen in top shape during a Super Bowl party.